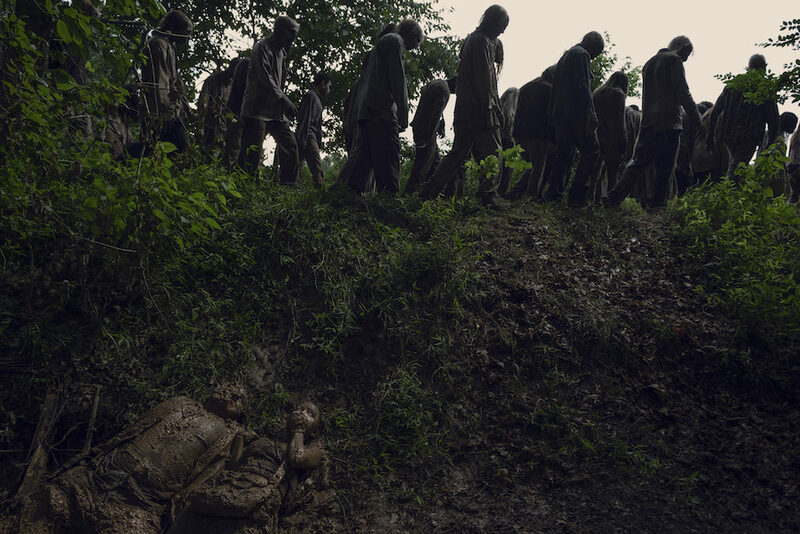 REVIEW: 'The Walking Dead' Season 9, Episode 6 "Who Are You Now?" Six years after Rick Grimes’ death, the core group of survivors are split and aren’t the people we used to know. Or are they? Here’s our review of “Who Are You Now?”! “Who Are You Now?” is a take on the three questions that the survivors used to use back in season four. Since so much time has passed the questions have evolved. What have you done to survive? It might seem like they’re asking generally the same questions, but the slight difference is enough to let you know that they’re aware if you’ve made it this far, you’ve killed both walkers and people at some point. Instead of asking why they killed them, the question becomes what have you done to survive. Have you killed? Stolen? Lied? The truth is they’ve probably done all of those things just like the group we’ve followed for nine seasons. This episode is about recognizing the dark things they’ve all done. In fact, that’s how Michonne opens the episode. She’s at the riverside, talking to Rick, and she mentions that the road ahead is just getting darker. Later in the episode, Negan alludes to people looking the same on the outside, but the inside being what’s bad. There’s no true way to know what kind of people you’re running into until it’s too late. In the world they live in now, sometimes it’s better to close off instead of trying to make things work as a larger community. 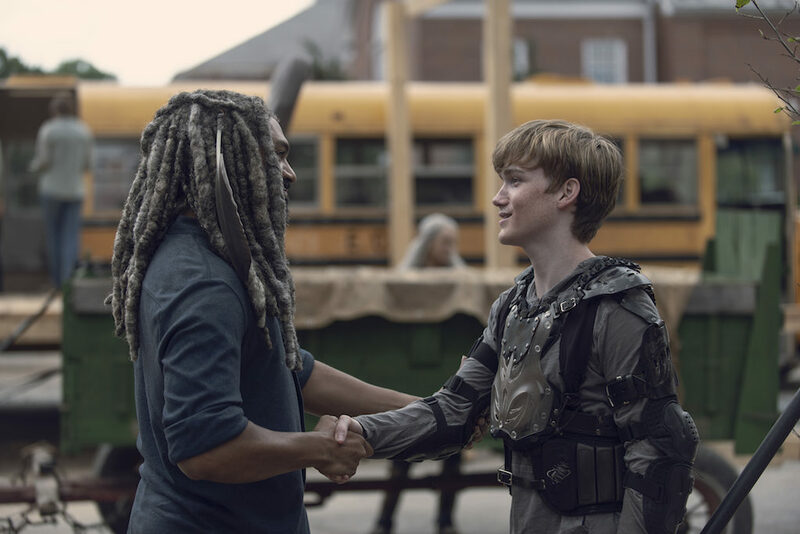 The audience gets the feeling several times through the episode with mentions of the communities not working together as much, veiled mentions of something happening at Hilltop, and most visibly, the bridge never being completed after Rick’s death. The future that he saw was never realized, and part of the reason is because of the darkness in the world. When bad things happen, people tend to turn into themselves, and it appears that happened after Rick’s death. Also, there’s an event that’s yet to be revealed. Something that happened at Hilltop, involving new people being let in, and probably something to do with Michonne’s new scar on her back. The years have brought change to Team Family, and you can feel the sense of tiredness they all exude. Underneath it all, though, is a spark of hope that has them moving forward. Let’s take a look at where everyone is at in “Who Are You Now?”. There are potential comic spoilers below, so don’t read if you don’t want an idea of where the graphic novels go. Family issues dominate this episode for The Kingdom. Everything is starting to fall apart, and Henry wants to go to The Hilltop to learn how to weld and fix things around The Kingdom, but Ezekiel doesn’t want him to go. He’s an overprotective dad, and he doesn’t want him to be alone. I understand this completely. Carol is there to talk to him into it, though. When Ezekiel asks her who will look out for him at Hilltop, Carol smiles and says she has an idea about that. On their way, Henry and Carol hear someone yelling for help, and Henry runs off to find the voice. It turns out it’s Saviors, and we learn the Sanctuary fell a long time ago. They trap Carol and Henry, take all their supplies and Jed even takes Carol’s ring. 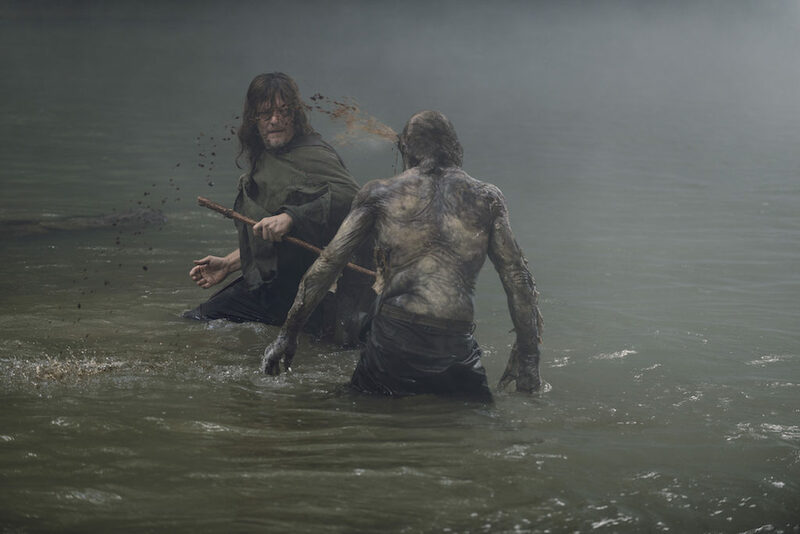 Henry’s pissed and uses his staff to hit Jed and another Savior before he’s knocked down. Carol covers him with her body and thrusts the ring at Jed. She tells him to take it and leave. Later that evening, Henry shares his frustration with Carol about how she handled the situation. He doesn’t realize that Carol is planning something. Henry tells her that she used to do that, too. He goes to sleep and Carol touches the finger where her ring used to be. The next time we see Carol, she has snuck away from Henry and finds the Saviors. She tells them that she could have let the ring go, but her friends worked hard for those supplies and most importantly, they hurt her son. She tosses down a match and burns them alive. The next day, they run across Daryl, and it becomes clear who Carol has in mind to keep an eye out for Henry. TL;DR: Carol is still a badass, and the Whisperers better watch out if Ezekiel gets his comic!death. JS. It seems like when he walked into the woods after Rick’s death, he actually stayed there. Carol knew where he was at and how to find him, so I doubt he’s been without any contact, but he won’t settle into one of the communities. I understand that Daryl retreats when he’s hurt, but I really hope they stop causing Daryl pain. The man deserves a break. Based on the preview for next week, he finally gets a dog, so YAY! I’m so happy for Norman Reedus. He’s asked for a dog for Daryl for years. A katana like her mom, a gun and boots like her dad, and a hat like her brother. 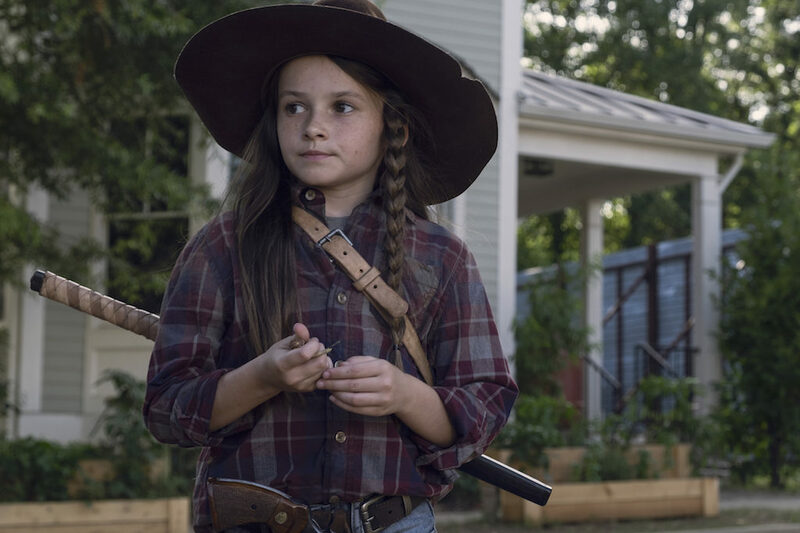 Judith Grimes is the perfect combination of all the people who’ve had a hand in raising her. She’s fantastic! 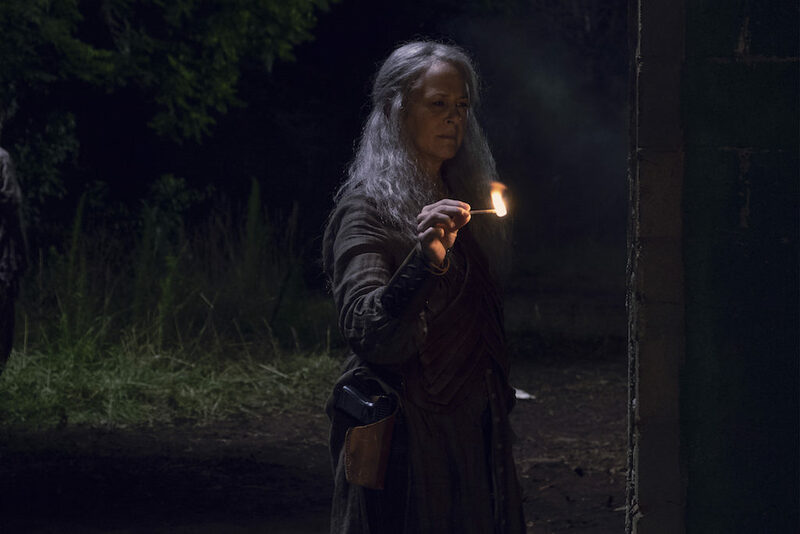 In this episode, not only does Judith save a group of people, she proves she can hold her own against Negan. During a moment of homework help, Negan gets tired of doing problems that don’t apply to the real world. Negan and Judith talk about the new group that was brought in, and he tells her a story about a dog he brought home that ending up killing all the other dogs at his house and attacked his mom. The dog didn’t look any different than the other dogs, but inside it was bad. This child is a sassy as young Carl, and I live for it! She’s the legacy of Rick and Carl Grimes, and it’s beautiful! She spends a good bit of time talking to Rick in “Who Are You Now?”. It feels a lot of like Rick talking to Lori after her death. I think it’s a coping mechanism for her since she never got to say goodbye him. He’s also one of the only people she ever truly trusted, and she respected how he tried to care for his kids. At the moment, it seems like she’s talking about the community, but later we see that Judith isn’t Michonne’s only child. She and Rick did have a baby together, RJ. Michonne’s trying to take care of their kids like he took care of Carl. In a sweet bonding moment, Michonne and Judith go outside and train with Judith’s own katana. It’s freaking fantastic! When it comes to the new group, Michonne has no desire for them to stay. She tells the council that decisions like this can come at a heavy price. With the way she looks at Gabriel and Aaron, I want to know what she’s talking about. Is it an event that happened before Rick’s death with allowing new people into communities or is she talking about what may have happened at Hilltop and has been alluded to already by Ezekiel? This is the big mystery of season nine right now. After all that, Michonne goes to Magna and asks to see her hand. There’s a tattoo there that shows that she’s been in prison before. She was also still holding a knife. This is a betrayal to her group, but also shows the others that they need to look deeper at who’s in front of them. That night, Luke tells Magna to hand over the necklace she took from the woman who was hurt, Miko. It’s a knife, too. Magna goes on to say that Bernie (a friend who died) would have wanted them to have this. I have no idea how this woman thinks that she can go and kill Michonne and somehow be welcome in this community, but okay, crazy lady. Luke tells Magna if she wants to fight with words that’s one thing, but they can’t fight fight. They need to save that for someone who deserves it. 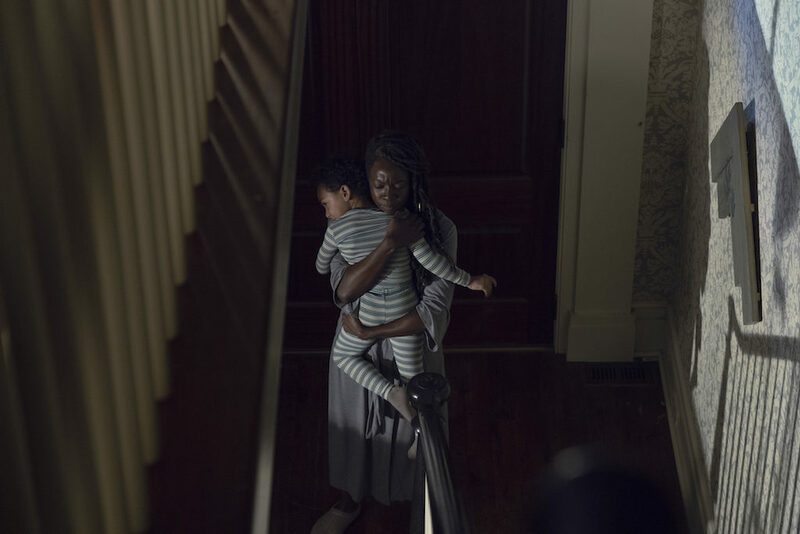 Magna sneaks out to Michonne’s home, and that’s when we see her with RJ. She doesn’t try and fight Michonne after that. I think she recognizes why she’s so guarded about newcomers. For the rest of us, RICHONNE BABY!! When Michonne goes inside, she sees Judith holding Rick’s gun. Judith tells Michonne that her dad would have wanted to have the gun and also do what she did yesterday. Judith acknowledges that Michonne talks Rick and Carl. She also tells Michonne that their voices are fading away for her. She doesn’t mean for them to, but they are. She goes upstairs and Michonne and me are devastated by this little speech and need to cry. 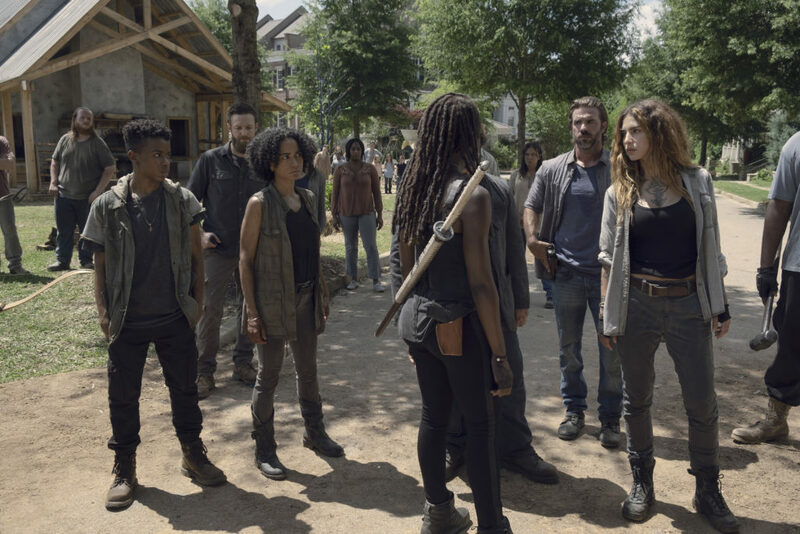 The next morning, Michonne tells everyone that the new group will be going to Hilltop. Rosita is with Gabriel. Yeah, just accept it and move on. Apparently Rosita can only exist in this universe if she’s attached to a man. Gabriel’s still working on radio and getting signals, and when he talks to Eugene, Eugene thinks if they go out further, they can get a hold of someone. What happened? If it was Rick, they wouldn’t dance around it. We all know about him, so I want to know what happened at Hilltop. Anyway, Eugene and Rosita head out to set up signals. During the trip, Eugene subtly tells Rosita that he likes her, but she shuts that down. Toward the end of her trip, he tries to confess his love, but she tells him not to make it weird between them. Just don’t do it, Eugene. When they’re setting up the signals, a herd stumbles on them, and Eugene ends up getting hurt as he’s coming down the water tower he was setting up stuff on. They get away into the woods, but there are walkers all behind them. It doesn’t look great for them, and they stumble into a ditch, covering themselves with mud. Hello, Whisperers! This is the next big bad on the The Walking Dead. One big takeaway from this episode was in the cold open. It’s been six years, and the bridge has never been rebuilt. Since this was Rick’s passion project and his hope for a future, the fact they the bridge was never finished is a big sign that we’re moving away from Rick’s story on this show. His presence will still be felt, but that chapter is over. Also, what’s that scar on Michonne’s back?? What did you think about “Who You Are Now?” Let us know! The Walking Dead airs Sundays on AMC at 9/8c.